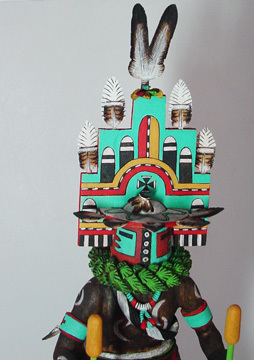 Probably one of the most beautiful and best known of all Hopi Kachinas is the Hemis Kachina. 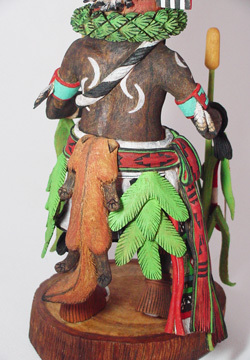 Often he is incorrectly called the Niman Kachina from the ceremony in which he is most often seen. 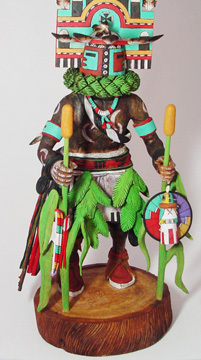 At sunrise, when the kachinas come to the plaza to dance for the first time, they bring with them entire corn plants, the first corn harvest of the year, to distribute to the audience. 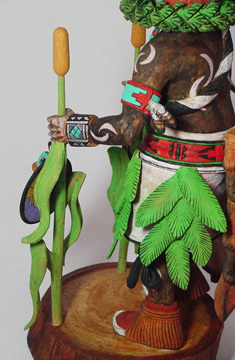 "Against the backdrop of these magnificent kachinas and their Manas can be seen a flurry of youngsters carrying the whole corn plants and brightly-colored presents to the sidelines. 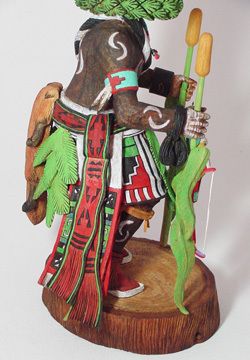 "In the Niman or the Home Dance no other kachinas appear, neither clowns nor side dancers, only the Hemis Kachinas and their Manas in a double line rotating slowly in opposite directions, and turning yet again. 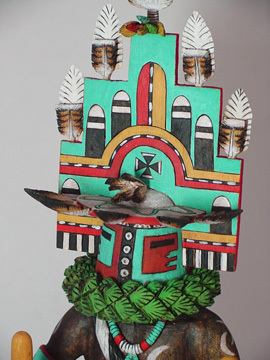 "This final dance of the kachinas is both stately and reverent. 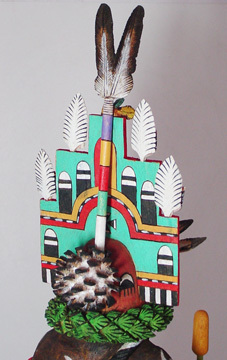 The Hemis Kachina is presumed to have come from Jemez, a Rio Grande Pueblo. 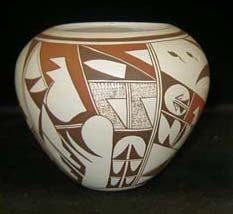 However, at Jemez Pueblo they have a ceremony in which the Hemis Kachina appears, and they refer to it as a Hopi dance." 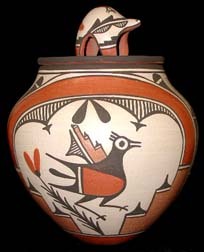 The Hopi have several borrowed kachinas, the Hemis Kachina, or Jemez Kachina, is one of them. 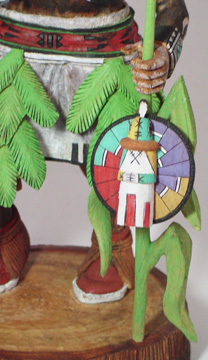 Kachinas are borrowed from other puebloes because they appear particularly effective in bringing rain or in exercising their other attributes. 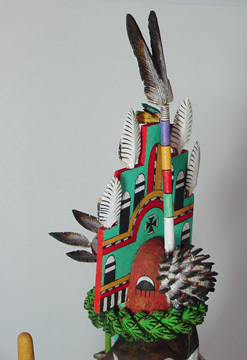 The Hemis Kachina is most often used for the Niman or Home-Going Ceremony when the kachinas leave the Mesas for six months. 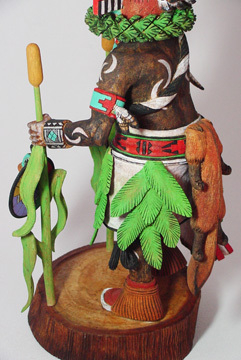 It is one of the most appropriate kachinas for this farewell, as it is the first kachina to bring mature corn to the people, indicating that the corn crop is assured. 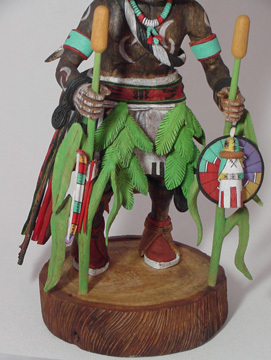 This kachina brings abundant, high-yielding crops of corn. This mask bears fertility symbols, and the wearer shakes a rattle to evoke the sound of rain. 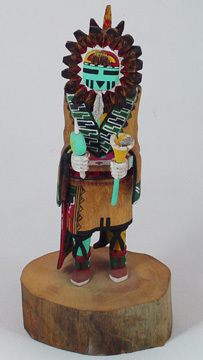 Malcolm Fred comes from a large family of Kachina carvers, which include brothers Jim, Verlan, Henry, Nathan and Glen. He has been carving and winning awards since he was a teenager. 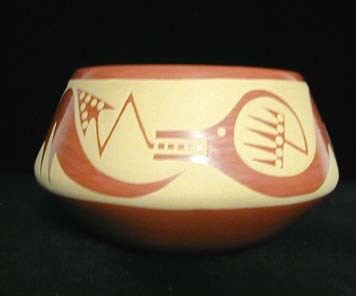 His awards include a Zuni Fire God which he entered into the 1996 Arizona State Fair. 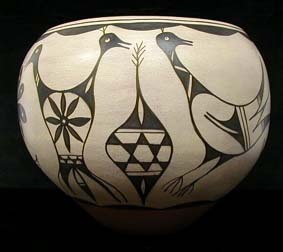 He is married to and has 3 children with a Zuni lady. 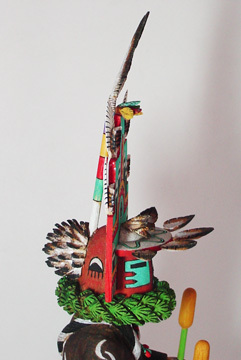 One of his favorite kachinas is the whipper which he seems to do most frequently. 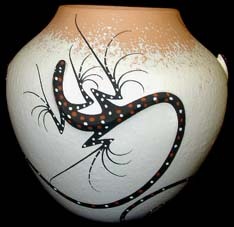 Malcolm is of the Greasewood and Roadrunner clans, and was raised in the village of Bacavi. 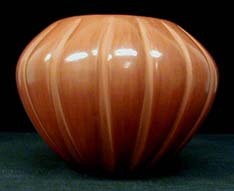 He has been carving for 25 years. His motivation comes from his religion, history, and the freedom of expressing his inner feelings. Malcolm continues to achieve incredible realism in his figures, and is known for his large and well-proportioned figures.